It is 6:00 a.m. and rangers call up at Saparingo outpost at the edge of Nyakweri forest in Kenya’s Narok county. It is also fondly referred to as the ‘elephant’s maternity’, because of its serenity, a safe haven for expectant elephant cows to give birth. It is 6:00 a.m. and rangers call up at Saparingo outpost at the edge of Nyakweri forest in Kenya’s Narok county. It is also fondly referred to as the ‘elephant’s maternity’, because of its serenity, a safe haven for expectant elephant cows to give birth. Saparingo is one of four community ranger units supported by the World Wide Fund for Nature (WWF)-Kenya, through the African Elephant Project in the Transmara Conservation Area. The aim of the project is to strengthen wildlife monitoring in under communal land. Enduring the chilly morning cold, the rangers who are predominantly from the neighbouring villages in the Transmara Conservation Area (TCA) line up for their routine drill led by Warden Karioki Kisiool. 11 rangers in total have all been trained and equipped with the right gear for the patrol. On a typical day, the rangers conduct separate foot patrols and cover distances of between 10-15 kilometres. 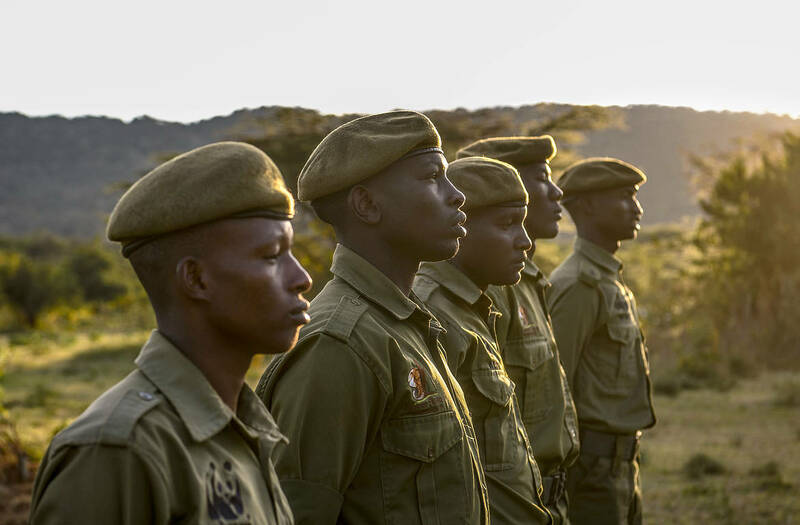 One of the tasks by Kisiool, is ensuring the well-being and health of each of the rangers and reiterating their important contribution in safeguarding people as they protect wildlife. “Protecting Nyakweri Forest and the elephants starts with creating good rapporteur with the local communities. Be kind to people and follow the law when you meet anyone engaging in illegal practices.” this is his mantra as a patrol leader. Though not armed, the Saparingo rangers opt for participatory approaches when engaging with communities mostly through community meetings (barazas). Direct confrontation with poachers and illicit loggers is risky and is best tackled collaboratively with armed law enforcement teams from Kenya Wildlife Service (KWS) and other partners. Regular joint patrols with KWS, Kenya Forest Service (KFS), Kenya Police and rangers from neighbouring conservancies have also led to a reduction in destructive activities within the main forest block and also led to several arrests. Over 200 suspects have been arraigned and prosecuted at Kilgoris law courts since 2017 for wildlife crime related offences. These patrols are focused on key hotspots subject to rampant habitat destruction and wildlife poaching and human-wildlife conflict within the Transmara Conservation area such as Sitoka, Laila forest, the Murghor River and Nyakweri forest. WWF-Kenya together with partners within the landscape will continue to support and strengthen the communities in Transmara Conservation Area to ensure people and nature live in harmony. Peter Lokitela from WWF-Kenya trains conservancy rangers during early morning drills at the Ololaimutia ranger post at the border of Mara Siana conservancy. Mara Siana, Kenya.